Our multi-cloud strategy is helping us accelerate application delivery and land each application in the right place on the right device. As part of that strategy, Intel IT used design best practices to create a cloud application platform. This platform—more specifically, platform as a service (PaaS)—makes it easy to create, deploy, and manage web and mobile applications. The platform provides a ...highly available and secure environment, eliminates the need for time-consuming server management tasks, and frees Intel developers to focus on application development. 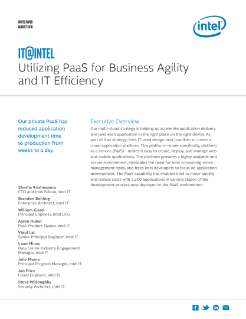 The PaaS capability has enabled Intel to move quickly and reduce costs with 3,200 applications in varying stages of the development process now deployed to the PaaS environment.